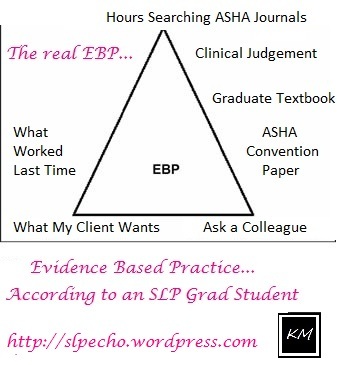 Anywho… Evidence Based Practice: What drives Speech-Language Pathology and Audiology. Our Supervisors give us the task to find 3 articles to support the type of therapy intervention we choose for our clients. I decided to use a Play-based therapy approach termed Milieu, where the child directs therapy, given a set of activities I pre-determine. 1. Hancock, T. B., & Kaiser, A. P. (2002). The effects of trainer implemented enhanced milieu teaching on the social communication of children with autism. Topics in Early Childhood Special Education, 22, 39–54. 2. Concroy, M., Haydon, T., & Mancil, G. R. (2009). Effects of a modified Milieu therapy intervention on the social communicative behaviors of young children with autism spectrum disorders. Journal of Autism & Developmental Disorders, 39, 149-163. 3. Gazdag, G. & Warren, S. (1990). Facilitating early language development with milieu intervention procedures. Journal of Early Intervention, 14(1), 62-86. While UWG is not a Thesis Masters Program, the lengths at which I had to go through to find similar articles all supporting the use of Milieu Based intervention was ridiculous. Each semester we must do these EBP based assignments in order to prepare us for finding answers to questions when the time comes I won’t have a Supervisor to turn to. I may have dreaded the assignment at first, and even loathed the idea of research; yet now, I can answer my own questions. I’m learning to rely on my own clinical judgement, the input of my client and family, and go to the research. Finally, I see how research is not just a boring ‘assignment’; it adds meaning to my therapy and gives me ground to stand on if questioned about my technique. 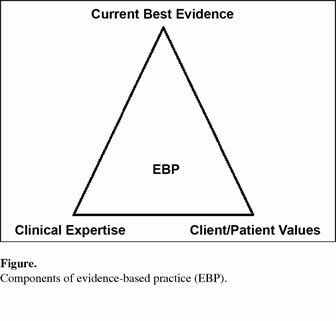 Great thoughts about EBP. I know exactly what you mean about it being endless work to find articles for things, but I also am so grateful for the ability to be able to critically evaluate treatment approaches based on their evidence. And yeah…it should probably be the EBP octagon considering how many aspects truly go into solid research!